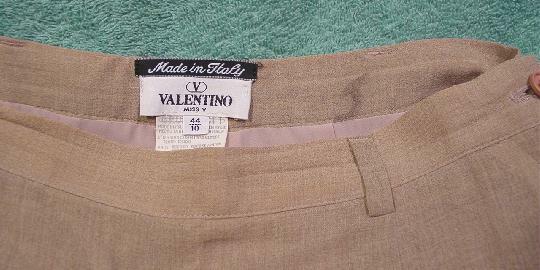 These multi-tone sandy-pale cocoa pants were made in Italy and are Valentino Miss V.
The closeup picture shows a more accurate color. They are 44% rayon, 22% silk, 22% wool, and 12% nylon. The full pale cocoa lining is 100% polyester. 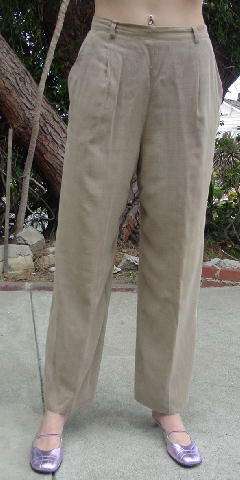 There are a 1 1/8" wide waistband, belt loops, a left side 7" long zipper, and one button waistband closure. 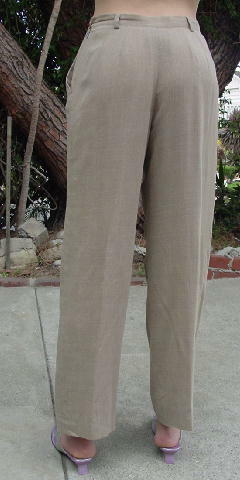 The front has two angled pockets and two short open darts below the front belt loops. The tag says sizse 10 (44). She marked the inside of the waistband with a J so she would remember which actress wore them.